Earlier today, we received a tip regarding Notion Ink's yet-to-be-released developer program for its "Genesis" app platform. Indeed, while the developer homepage remains relatively useless, the leaked developer program registration page the tipster sent us does appear to be legitimate and even comes complete with terms and conditions. Update: As some of you so eloquently pointed out, the developer program was indeed active at one point, and the registration has now been closed (at least partially, apparently). Nevertheless, we believe some details weeded out of the terms and conditions and displayed below are relatively unknown and quite valuable. After registering and clicking the confirmation link in the email from Notion Ink, I found myself at the end of the road, as the actual pages for developers could not be found. 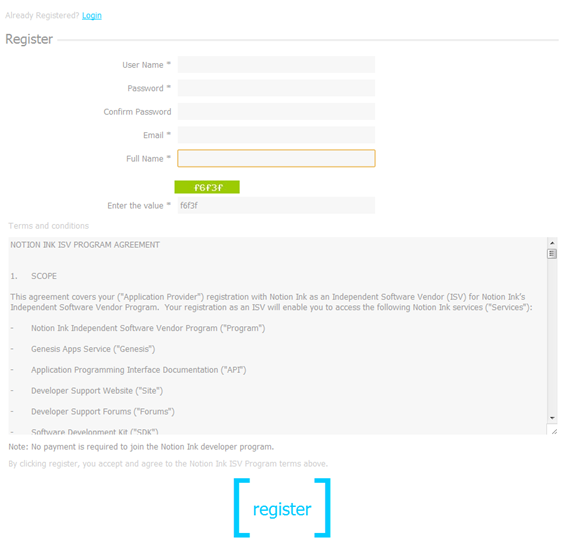 Developers are given access to a number of "Notion Ink services", such as the the Genesis Apps Service, the API documentation, the Developer Support Website, the Developer Support Forums, and the SDK. Genesis is the name of Adam's dedicated Market and will be the focal point for all developer content. Distribution of apps must be made through Genesis, but Notion Ink can refuse to distribute an app for "any reason". Unlike Android's app approval system, which essentially allows any app into the Android Market, Notion Ink appears to be taking a page out of Apple's playbook by controlling the apps that are available through Genesis. Apps are also not allowed to contain "any obscene, pornographic, offensive or defamatory content". This is a fairly standard term, but it is open to interpretation at the discretion of Notion Ink. Interestingly, it is also not possible to create apps with any sort of VoIP functionality without a separate agreement with Notion Ink. 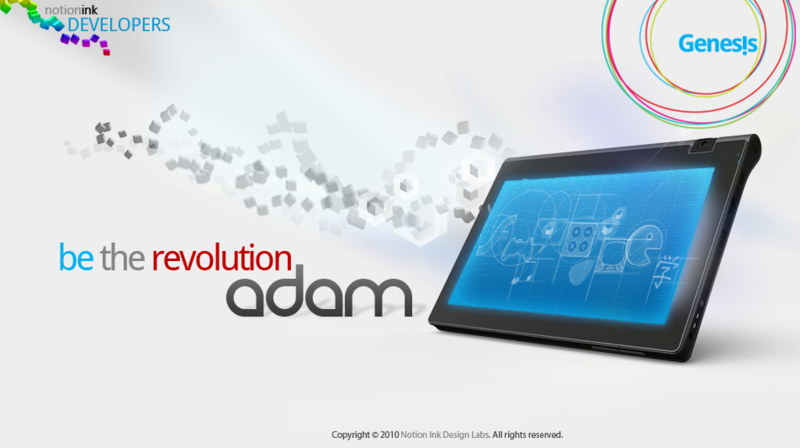 The Adam is not primarily a voice communications device, but having the ability to talk with others over a mobile network would be a fantastic feature. I am hoping that Notion Ink does not limit VoIP apps for the Adam. Notion Ink will also take a 30% commission fee for all paid apps sold through Genesis. This is standard practice employed by both Google and Apple in their respective app stores. No word yet on when the partially exposed developer program will actually be launched or the SDK be made available.